Gameplay: This point and click game comes in 2 CDs. After installation the game can be played with no CD on the CD drive. The Main Menu has New Game, Load Game, Options, Credits and Exit. 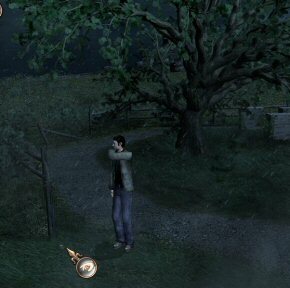 The Options Menu has music, effects, brightness, captions, shadows, animated water, fog, rain-lightning and anti-aliasing settings selections. The In-Game Menu has resume, save, load, options and main menu selections. To save at the save game screen, select an empty frame to save a new game or click on a picture to overwrite that saved game. The saved game can be titled by typing in a name left of the saved frame. The cursors are self-explanatory by the icons seen. The ESC key accesses the in-game menu. Right click of mouse or click on the sack at top left of screen will access the inventory. Right click again will close the inventory frame. The inventory is made up of 5 screens that can be scrolled using the top arrows on the frame. To look close at an item, click on the item and bring the item over the magnifying glass at the bottom of the inventory frame. The gear button right of the magnifying glass combines items by placing the items on the row above the gears and then do a click on the gear icon. Combined items can also be disassembled by doing the same procedure or click the item directly on the gear icon. To the top right of the screen is the journal icon. The journal has general information, guests, documents and books. Documents or books taken in inventory are entered in the journal by clicking the documents or books on the magnifying lens icon. The pertinent information is summarized in the journal. The ESC key skips the intro and cutscenes. Double click makes Narracott runs. Judge Lawrence Wargrave is seen with a mother and child in a private car. Vera Claythorne is sitting across Phillip Lombard. General John Mackenzie wakes up from a dream about his wife, Leslie. Across him is Miss Emily Brent. Anthony Marston passes Dr. Edward Armstrong's car and stops to take a packet from a man at a side of the road. Back at the train, William Blore reads his checklist. At the dock, Davis the harbormaster greets the guests after the arrival of Marston. Blore recognizes Patrick Narracott. Thomas Rogers and his wife Ethel await the guests arriving on the boat. Note: This game is non-linear and most side puzzles can be done anytime as long as the items necessary have been acquired. This walkthrough shows only one way of gameplay and the triggers to move to the next chapter. One choked his self and then there were nine. Read the journal by clicking the top right journal icon. Rogers thanks Narracott for the help. Try to take the left path but the investigation will have to wait. Go back down to the pier and click on the boat. See that the boat was scuttled. Southside cliff path - Go back up, turn left on the path after the steps and meet Marston. Talk with Marston and note what he is holding. Turn back to go back to the mansion and talk to Rogers. Kitchen - Enter the mansion and follow Rogers to the kitchen. Enter the dining room and then through the kitchen door. Hear an argument between Rogers and Ethel Rogers. Talk to Rogers. Look close at the press right of Rogers. Exit through the door right of the refrigerator. Rogers' room - Enter the door in the hallway. Take the letter for Rogers, the sewing needles and Roger's letter of invitation. In inventory, take the letter of invitation and click it on the magnifying lens to enter it on the journal. Do the same for the letter to Rogers. Read the letters from U. N. Owen in the journal. You can check the bathroom also. Exit and take the service stairs. This map is for location reference only and is not to scale. Linen closet - Talk to Mrs. Rogers. Help Mrs. Rogers with the silk sheets. Exit the service room and check the rooms around the second floor. Note that all the clocks in all the rooms do not work. Dr. Armstrong's room - Turn left from the service door and enter the room left of the bathroom. Take Dr. Armstrong's letter of invitation. Click it on the magnifying lens to enter it in the journal. Look inside the doctor's bag on the dresser. Blore's room - Take Blore's letter of invitation and enter it in the journal. Try to take the diary on the bedside table and get stopped by Blore. Talk to Blore. I'm Patrick Faine not Fred. You were taking the Purcell's bribes for years. After the Landor case people began to ask questions. The Purcells needed what the yank detective novels call a fall guy. Lombard's room - Look through the keyhole and see Lombard with a gun. Knock on door and talk to Lombard. Vera Claythorne's room - Talk to Vera. Emily Brent's room - Talk to Emily Brent. General Mackenzie's room - Talk to the General. Go downstairs to the game room. Game room - Listen to the conversation between Judge Wargrave and the doctor. Dinner bell is heard. Kitchen - Eavesdrop through the dining room door and note the conversation. Take the copper fruit basket from the table. Pantry - Go to the pantry right of door to the outside. Take turkey baster, cheese wheel covered in cheesecloth and scoop. Use the scoop on flour sack to get flour. Use the scoop on flour sack again to get battery. Exit the kitchen using the door right of the refrigerator and climb the service stairs. Linen closet - Take silk sheet from linen closet. Marston's room - Take the coded message from the dresser and look close at it using the magnifying lens. Take the code-breaking cypher from drawer right of the bed with lion statue. Take the Marston letter of invitation and enter it in the journal. General's room - Take Mackenzie's letter of invitation and enter it in journal. Look close at picture beside the bed. Emily Brent's room - Take Brent's letter of invitation and enter it in journal. Take the King James Bible. Look at the contents of the makeup case. Exit through the bathroom door. Emily and Vera's bathroom - Check the table and take the medical alert card. Read it in inventory. Take the stem to an old pipe wedged between the wall and the table. Enter the room next door. Vera's room - Look at the bear clock on the table beside the bed. It is not working as all the clocks in the whole mansion are. Open the makeup case on the side table. Take the newspaper clipping and enter it in the journal. Look at the picture on the dresser and on the wall. Take Vera's letter of invitation and enter it in journal. Exit through the patio door. Take the telescope and metal tripod at the corner beside the hawk. Enter the next room. Lombard's room - Take Lombard's letter of invitation and enter it in journal. Blore's room - Take the diary and enter it in the journal. Judge Wargrave's room - Take the tobacco pouch and pipe bowl from dresser. Take Wargrave's letter of invitation and enter it in journal. Read everything entered in journal. Go downstairs and take the bear walking stick on stand left of main door. Eavesdrop on dining room door again. Listen to the absent host's speech accusing all the characters except Narracott. Mrs. Rogers faints. Get doctor's bag from Dr. Armstrong's room upstairs. Go to Rogers' room that can be accessed through door behind the main stairwell and give the bag to Dr. Armstrong. Parlor - Listen to the discussion of the accusations. Dr. Armstrong reports that Mrs. Rogers is sedated. Talk to all 9 characters in the parlor completely. Check on Mrs. Rogers in her bedroom. Her feet are twitching. Go to the gramophone at the foyer and take the record. If possible, look at record in inventory. Listen to next discussion. Marston chokes to death or is poisoned. Talk to all the characters in the parlor again. Parlor - Look close at and click on the Ten Little Sailor Boys rhyme on top of the fireplace. Take the matches from the mantle. Look close at radio by the window. Look close at the liquor table behind the couch. Take 3 glasses, Marston's glass and cocktail shaker. Study - Enter the door to study. Look close on map on wall and click on Shipwreck Island. Books - Look at bookcase left of door and see Judge Wargrave on Justice book. Take the Birding on Devon Shores book on the next left bookcase. Take the book on chair, A History of the South Devon Coast and the book on table under the map, A diary. Enter the 3 books on the journal and then read the journal. Look close at the picture right of the map of the former owners of the mansion. Desk - Go to the desk and take the desk lamp with bulb. Take the sellotape from middle drawer and the inkpad and inkstamp from top side drawer. Take the map of the island the card at bottom side drawer. The top left drawer is locked. Read the powerful friends card - Powerful Friends: Want to shine light on the matter? Flowery speeches may win you a few friends. Study the map in inventory - note the different places. Place cursor above desk to exit close up. Gramophone at Foyer - Take the record from the gramophone. Look close at record in inventory. Turn the record and see a label of 'goodbye'. Play the goodbye part on the gramophone by placing the record on the gramophone and clicking on the flip switch. After listening to the host's game explanation, click on side panel and take large vacuum tube UX-201A and small vacuum tube 807-H. Dining room - Take the flashlight on top drawer of the table under the painting. Upstairs - It's too dark to search upstairs. In inventory, combine the flashlight taken from dining room drawer and the battery from the flour sack by placing the battery and flashlight on area above the gear icon. Click gear icon to combine the 2 items to make flashlight with batteries. Climb the stairs and check each room. Click on the General, Dr. Armstrong, Lombard and Emily Brent in bed. It's getting to be morning, best to get back to bed. Dining Room - Enter the dining room and listen to the breakfast discussion. Learn about Mrs. Rogers. Emily Brent still insists on her promised apple juice. Talk to everybody. Give the bear walking stick to the General and talk to him again about Lombard. Find a way to get off the island or make a signal fire. Look close at the sailor boys on the dining room table. Game room - Go to Game room and overhear the Doctor and Judge's discussion. Talk to Judge and Doctor. The door to the screening room is locked. Exit the mansion through the front door and talk to Emily Brent. Go down the steps and take the left path. Shed - Go forward twice and enter the shed. Try to take the axe. Take the shovel, lamp and the card. Read the card - Empty promises: Dark memories haunting you? The fuel for pleasant thoughts must be found before all lie in ruins. Go down of screen and take bucket and ladder. Look close at generator. Garden - Take the right path around the garden. Take the garden hose close to the pump. Click the bucket on pump to get a bucket full of water. Go left, forward and left to get back to the front part of the mansion. 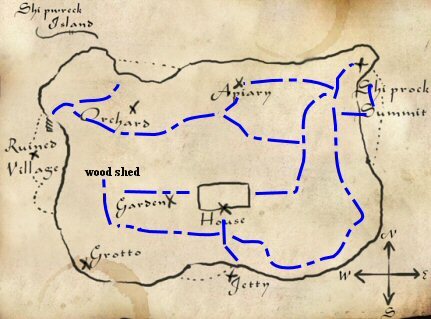 Southside cliff path - Look at the map of the island in inventory. Go to bottom of screen and take the left path that surrounds the island. Meet and talk to Blore and Lombard. Lombard gives a parachute plan. Read the parachute plan in journal. Go forward and click on Shiprock Point and note that it is the highest point in the island. Beach - Go forward and go left to the beach. Go left and talk to the General. Click at bottom of screen twice to go to the secluded part of the beach where the waves are crashing with particular violence. Go back and up to the path. Take the right path twice to go up to Shiprock Point. Shiprock Point - Talk to Vera. Exit the point area and take the path going up at the crossroad. The path to the left leads directly to the study door of the mansion. Apiary - Go forward 5xs to get to the apiary. Take the fermented apples. Look at the beehive. Go forward and take the left path. The right path goes back to the mansion. Orchard - Look at the apples on both side of the path. Place the ladder under the apples on the right side. Click on apples to get fresh apples. Go left and take the top right path on the split in the path. Billy goat - Look at the sunflowers then go forward to meet Mr. Billy Goat. Click on Billy and he won't let you pass. Click the bucket of water on the water trough. There you go - he was just thirsty. Go left to the ruined village. Ruined village 1 - Check all the houses. Take the gas can from the first house. Take the leather goat harness from the second house. Exit the ruined village and go forward until the split in the road. Take the bottom right path and see that the path is blocked by thorny thicket. There are 2 hungry goats there. Go back to the mansion by going forward until the split in the road in front of the apiary. Take the right path. Click on the windmill. Take the left path after emerging from the rock wall. Go left to get to the study door. The right path goes to Shiprock Point. Enter the door to the study. Study - Secret room - Bookcase at far wall - Go to the bookcase left of the desk. Take the 3 misplaced books on the shelves of the middle bookcase - dark red book at top, light colored book in middle and light red book at third shelf. Read them if you want - not necessary. Place the 3 books back in their proper places based on the color - light red book (Panama Locks) on top shelf, dark red (South Sea Island) at second shelf and the light colored one (Florida Keys) on third shelf. Hear a click when you place the correct book at the correct place. Radio room - Enter the secret room. Take and read the talk card from the chair - Talk is cheap: And rumours can be ugly. Keep your secrets safe. Look close at poster - Rule Britannia! Britannia - rule the waves. Look close at shortwave radio and note the slots for lamps and the power cord. Take the 305GT vacuum tube from the panel. Safe - Look close at safe. Remember the statement by the judge concerning Marston, Marston's suspicious acts and the 2 papers taken from Marston's room. Combine the coded message, the code breaking cypher and the King James Bible taken from Emily Brent's room to get decoded message. Enter the decoded message on journal by clicking it on the magnifying glass. Read the decoded message and note the homing beacon on buoy and the combination to the safe. Save game here. Open the safe by clicking left arrow to get 28 to be under the top arrow, right arrow to 11 and left arrow to 49. Hear a click and then click on safe handle. If mistake is done, go back to saved game. Safe Room - Take the rubber raft. Click on wall right of drawers and note a sliding panel. Drawers - Look close at drawers and open (click twice on) E to get raven earring, H to get document piece, S to get microphone and V to get boat card. Read boat card - Row your boat - Gently down the stream. Unless it's a fishing boat and the sea is mean. Anagram sliding panel puzzle - Form a known phrase. Arrange the drawers by clicking on 2 drawers you want to change positions. The drawers will interchange position. Form a known Admiralty phrase - Rule the Waves. The panel opens. Grotto - Enter the secret door and flip the switch to get light. Go forward to the grotto. Go to the right and look at the one man submersible. Take the propeller. Go back and take the other metal bridge to the other side of the grotto. Look close at the barrels right of door. Take oars. Underground passageway - Enter the door. Take the pliers on ground in front of the out of place panel on opposite wall. You might need to move Narracott to get him out of the way. Click on panel and enter. Look at indentation on the ground. Use shovel on the active ground. Take the air pump. Go down to the end of the underground passageway and see that the door is locked fast. Go back to the grotto. Paddle to get off the island - Go to the grotto and inflate the rubber raft. In inventory, combine the rubber raft, air pump and oars. Take the left walkway up to the end and be at the mouth of the grotto. Place the inflated rubber raft with oars on the water in front of the metal walkway close to the opening to the grotto and sea. Ruined village 2 - Click on the far houses on the other side of the ruined village - that is the area after Mr. Billy Goat. Go to the closest house and open the wood box. Take the fishing net. Exit the house and go to the left of the house. Take the Bones card by the Celtic cross. Read the card - Old Bones: Are left undisturbed. Not new bones however, if you're game. Go back to the underground passageway by entering the storm door by cliffside. Go back to the mansion. Game room - Take the dice box on the table - this is seen only after getting the Bones card. Click the dice box on the gear icon in inventory and get desk key. Study - Go to the desk and use desk key on left drawer. Take the bee book and enter it on the journal. Read the journal to learn how to make a smoker. Go to apiary. Make a smoker based on the bee book. In inventory, click tobacco pouch on gear to disassemble it to empty pouch and tobacco. Combine hurricane lamp and tobacco to get lamp with tobacco. Combine lamp with tobacco with garden hose to get unlit smoker. Combine unlit smoker and matches to get makeshift smoker. Use makeshift smoker on a beehive. Open beehive when they are now asleep. Combine honeycomb frame with cocktail shaker to get cocktail shaker filled with honey. Combine cocktail shaker with a glass to get a glass with honey. Make a finger print testing tool - In inventory, combine turkey baster and flour to get turkey baster with flour. Use the turkey baster with flour on items that might have fingerprints. Once the flour is applied. Use the sellotape to get the finger print. Use the turkey baster with flour on Marston's glass in inventory. Use sellotape on floured glass to get print taken from Marston's glass. Go upstairs and do this procedure on the doctor's bag in Dr. Armstrong's room. Get reference print for Dr. Armstrong. Do the same for the makeup kits of Emily Brent and Vera in their rooms. Get reference print for Vera Claythorne and Emily Brent. Do the same on the handle of Marston's attaché case in Marston's room to get Marston's reference print. In inventory, combine a character's reference print with that of the print from Marston's glass. See that only Marston's print is a match. Note: Roger's fingerprint can be taken from the embrocation bottle in his bathroom and from the sailor boys at the dining room at beginning of game. Talk to Rogers in the kitchen. Fruit press - In inventory, separate the cheese and the cheesecloth. Place cheesecloth on press bucket. Place apple on bucket with cheesecloth. Place glass in front of spout. Place the propeller on press. Click on press to get fresh apple juice. Now do the same for the fermented apples to get glass of apple cider. Exit the kitchen door to go outside to the garden. Go to the woodshed and talk to Blore and Lombard. Talk to Emily Brent at front porch about sewing the parachute. Automatically give her the silk sheets. Give her the needles from Roger's room. She needs strong thread. Talk to Blore and Lombard for the third time at front steps to end the sequence. Dinner - Listen to conversation. Talk to everybody including Rogers in kitchen. Listen to Judge Wargrave's summation. Talk to Emily Brent in parlor. Give Emily Brent apple juice to sweeten her up and talk to her again about Vera. Talk to Dr. Armstrong in his bedroom. Then give him the honey in glass for his sweet tooth. Talk to him again and learn about the Judge. Talk to Judge Wargrave in General Mackenzie's room. Go to right screen after entering the room and see the judge sitting beside the bed. In inventory combine the pipe bowl and pipe stem to get a pipe. Give pipe to the Judge. Talk to him again and learn more about Marston. Show the Judge the document taken from the drawer at the safe room and he will say that it is part of a legal document. (Thanks, Joao! )Talk to Blore in Roger's bathroom. Talk to Rogers by dining room door. Screening room - Go to the now opened screening room and talk to Vera and Lombard. Another night passes, talk to Vera in her bedroom and have 2 knights arrive to protect the lady. After the discussion, be outside with Blore. Go down the steps and meet Emily Brent coming back from her walk. Go to the woodshed and find Rogers. After the discussion at breakfast, time to thoroughly search for clues. Try to talk to Dr. Armstrong in his bedroom. Talk to the Judge at the game room. Screening Room - Look at all the posters of Gabrielle Steele. Projector - Go to the projector and open the drawers. Take the 2 Empire Studios film canisters from second drawer. Take the untitled reel and projector bulb from third drawer. The top drawer is locked. Place the projector bulb on the panel beside the flip switch of the projector. Flip the switch to watch a vessel that was fired. Replace the reel on the projector with the untitled reel and watch a home movie of some sort. In inventory, disassemble (click item on gear icon) one of the Empire Studios film canister to get a Last of the Borgias film and the Air card. Read the Air card - Taking the Air: A breath of fresh air is rare when buried in windowless rooms and scarcer elsewhere. Disassemble the other film canister to see a handwritten note and the Queen's Handmaiden film by Gabrielle Steele. Read Gabrielle's note. Try to watch the Steele movies by placing them on the reel and Narracott refuses. They will be gone from inventory. The screen can be raised and lowered. If the projector is turned on and the screen is up - "Three Days" is seen on the wall. (Thanks Amitai & Joao!). Dr. Armstrong - Go outside through the front door and eavesdrop on Dr. Armstrong and Emily Brent. Talk to Emily Brent. Go back inside mansion and check on Dr. Armstrong. Look through the keyhole and see the good doctor take a freshener. Shiprock Point - Go down the steps from the mansion and go forward until the lights. Take a left at the path by the cliff's edge and forward to Shiprock Point. Take the right path twice to get up Shiprock Point. See Vera and Lombard. Talk to Vera. Protected cove - From Shiprock Point, take the path going up on the crossroad, pass the apiary and the orchard. Go forward and take the path at lower right and see the hungry goats. The path forward is blocked by thorny thicket. Pour the apple cider on the thorny thicket and the goats will eat them. Go forward towards the beach. Take the fishing line at right by the rocks. Look at the horizon and see a blinking red light. Use the telescope on the horizon and see a homing beacon on a buoy. Ah, remember Marston's decoded message. Wood shed - Go to the wood shed off the mansion's kitchen or garden. Talk to Blore. After the vocal determination to get off the island, go back to the mansion and give the fishing line and needles to Emily Brent at the front porch. Enter the mansion, go to the study (see Vera) and to the shortwave radio in the secret room. Insert vacuum tubes 80-7H and 305GT in panel on the left. Close panel. Click the microphone on shortwave radio. Disassemble the desk lamp to get desk lamp without bulb. Click on shortwave radio and listen to fisherman talking. Use the microphone to make a distress call. What was that? Owen! Take all the vacuum tubes from the shortwave radio. Go to the radio by the parlor where Dr. Armstrong and Judge Wargrave are talking by the fire. Insert all 3 vacuum tubes in panel on the left. Close panel. Combine the copper basket and the pliers to get copper wire. Place copper wire at back of radio. Turn the radio on. Some light music might help soothe Vera's nerve. Time to make that parachute. Go back to Emily Brent and ask if the parachute is done after having given her the needles and fishing line. Automatically get the parachute. In inventory, combine sewn silk sheets, fishing net from ruined village, metal tripod of the telescope and the goat harness to make a parachute. Go to Shiprock Point and click the parachute on the horizon. Waaaahhhh!!! The homing beacon is now in inventory. Lombard yells that Emily Brent is heard screaming from the apiary. Go to the apiary via the path by the study door and forward until the hole on the rock wall on the left. Enter the hole on the rock wall and go forward until the apiary. Lombard and Dr. Armstrong are there. Listen to Judge Wargrave. After Lombard and Blore leave to get Lombard's gun, talk to Vera and then talk to the Judge. Talk to the doctor seated on the couch. Go up to Lombard's room and see that the gun is missing from a forced drawer. The body search is done on the 3 characters. Exit through the balcony door, go right and talk to Vera by the hawk statue at the balcony corner. Solidamide is written on the back of Narracott's plate. Narracott is poisoned. The antidote is turpentine oil found in Bellman's Universal Embrocation. The Embrocation causes nasty rash when over applied. The power goes out and Vera leaves to get her wrap. Later, Vera screams. Go upstairs to her room. Narracott is hit and falls down the stairs. Go to the dining room and a see the Judge shot. Generator - Go to the wood shed. Use gas can on generator. Click on switch on the square panel at right to get the generator going. Listen to the discussion. Talk to all and learn what Blore knows about the history of the island and Lombard's knowledge of the voice in the recording. The judge was wearing a wig. Watch the other characters hiding in their bedroom. A shadow crept out of the mansion. Blore went to investigate. Time to check the others in their bedroom. Judge Wargrave's body is missing from his bedroom. Only Vera is in her room. Go outside and search. Come back and check the bedrooms again. Lombard is back in his bedroom. Look around some more and check on Vera. Vera said that Lombard went to start a bonfire. Go to Shiprock Point and see a bonfire. Look around some more and go back to mansion. Talk to Blore, Lombard and Vera by Vera's bedroom door. Dr. Armstrong is missing. Lombard states that only 3 sailor boys are left. Dr. Armstrong and Judge Wargrave's body are still missing. Lombard will man the bonfire and Blore will stay in his room with an axe. Vera will also stay in her room with the gun. Go to the screening room and find Judge Wargrave's body. Dead and warm but not shot. Go outside the study door and see Blore dead. His head was bashed in by a marble shaped like a bear. Talk to Vera. Take marble. Go outside and check the bonfire at Shiprock Point. Go back to the beach below Shiprock Point and then to right at the cove beside the beach. Find Dr. Armstrong's body that has been washed ashore. It has been in the water for quite a while. Vera locked in her bedroom repeated the last rhyme about needing the sun to frizzle up the next victim. 1. Look around the mansion - check the bedrooms. Check outside (apiary, orchard) to waste time and then go to Shiprock Point and find Lombard dead when the bonfire exploded. 2. Go immediately to Shiprock Point and talk to Lombard. Save Lombard before the bonfire explodes. Lombard is really Charles Morley. Hear voice - voices coming from upstairs. SAVE GAME HERE. Climb upstairs and see a hangman's noose. Watch and listen to Vera and the elusive 'Unknown - Owen'. 1. Go to the bathroom door at end of the talk and Vera is shot. 2. Save Vera by getting the marble from inventory and clicking it on the hand of 'Unknown - Owen'. Narracott, Lombard and Vera are saved. Narracott and Morley (Lombard) are saved. Narracott and Vera are saved. Listen to the record. Go to the dining room and take the last little sailor boy. Go to the screening room. Place the last sailor boy on the small footprint at bottom right corner of the cabinet holding the projector. Open the formerly locked top drawer. Take the Hello Again film. Place it on the reel. Lower the screen if it is up. (Thanks, Susie.) Click the switch and watch the original ending.